Opossums (colloquially possums) (Didelphimorphia, /daɪˌdɛlfᵻˈmɔːrfiə/) mak up the lairgest order o marsupials in the Wastren Hemisphere, includin 103 or mair species in 19 genera. Thay are an aa commonly cried possums, tho that term technically refers tae Australie fauna o the suborder Phalangeriformes. 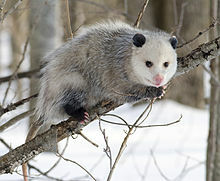 The Virginie opossum wis the first animal tae be named an opossum; uisage o the name wis published in 1610. The wird opossum wis borrowed frae the Virginie Algonquian (Powhatan) leid in the furm aposoum an ultimately derives frae the Proto-Algonquian wird *wa˙p- aʔθemw, meanin "white dug" or "white beast/ainimal". ↑ Gardner, A. (2005). Wilson, D. E.; Reeder, D. M, eds. Mammal Species of the World (3rd ed.). Johns Hopkins University Press. pp. 3–18. ISBN 978-0-8018-8221-0. OCLC 62265494. ↑ The American Heritage Dictionary of the English Language, Fourth Edition. 2000. Houghton Mifflin Company. The Free Dictionary. Retrieved 2010-09-12. Thefreedictionary.com. Retrieved on 2012-05-03. ↑ opossum. CollinsDictionary.com. Collins English Dictionary - Complete & Unabridged 11th Edition. Retrieved October 20, 2012. This page wis last eeditit on 9 Apryle 2017, at 00:24.